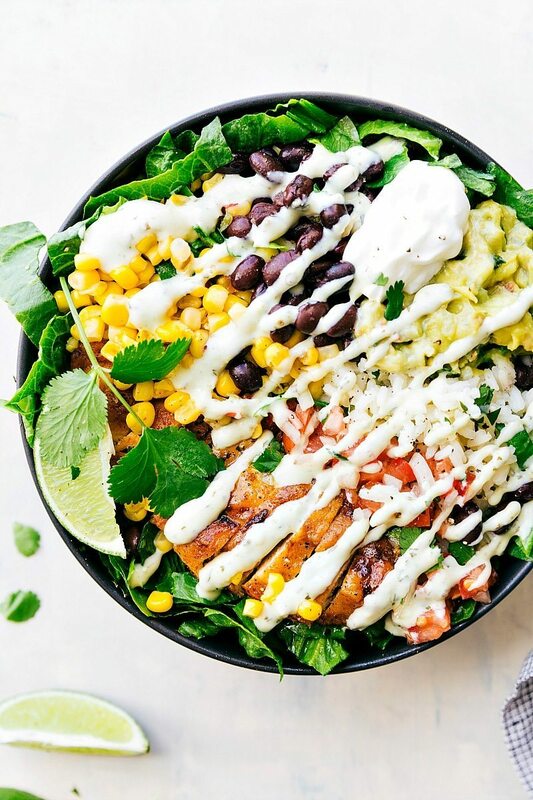 Chicken Burrito Bowls made with taco-seasoned chicken, cilantro-lime rice, salsa, guacamole, corn, beans, and a delicious creamy cilantro sauce. 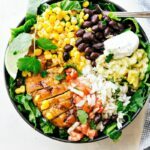 These chicken burrito bowls make a work week’s worth (say that 10 x fast) of healthy meal prep in under an hour of prep-time! So, the other day, the boys were playing and the baby took one of the toddler’s toys. We’ve been working SO hard on learning how to share, that I was beyond proud (beaming, really) when the toddler didn’t grab it right back out of his hands or push him over (the usual response). He sure knows how to keep me humble about my parenting skills. Or lack thereof. ? Since sharing is a very hard lesson for the toddler, he loves opportunities where he doesn’t have to share. If he and the baby get the exact same thing then he’s a happy camper. Although these meal prep bowls were meant for the husband to take to work for the week, the toddler and baby snuck some (warm ingredients only) and couldn’t have been more pleased at getting their own “no-sharing-required” bowls. They haven’t quite discovered (despite my attempts to convince) how delicious guac, pico de gallo, cilantro dressing, and lime are so they were plenty content with just the rice, beans, corn, and chicken. If you glance at the recipe card below you might feel a little overwhelmed — there’s A LOT. I tried to break down the instructions to make sure they are super clear, thorough, and allow the prep to flow well. 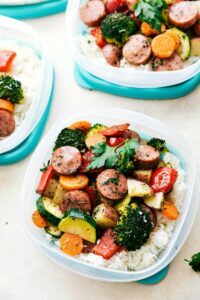 There are also a lot of ingredients, but most of the ingredients don’t actually require much prep besides opening containers and/or draining cans. 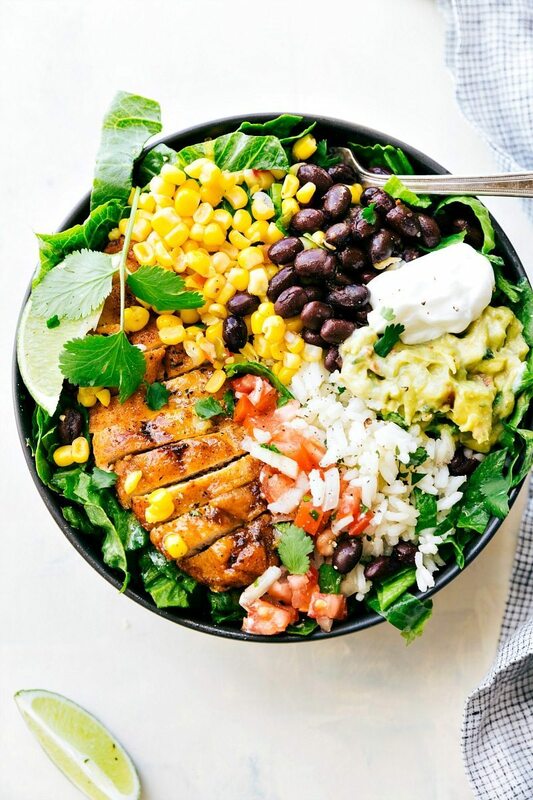 The corn, beans, pico de gallo, guacamole, & sour cream are all bought prepared so the only prep work you’re doing is cooking the chicken, making the rice (both can be done at the same time), blending a few ingredients together for the creamy dressing, and quickly chopping the lettuce. An hours worth of work (if it even takes that long) will be well worth it rewarding you with a week of amazing lunches. 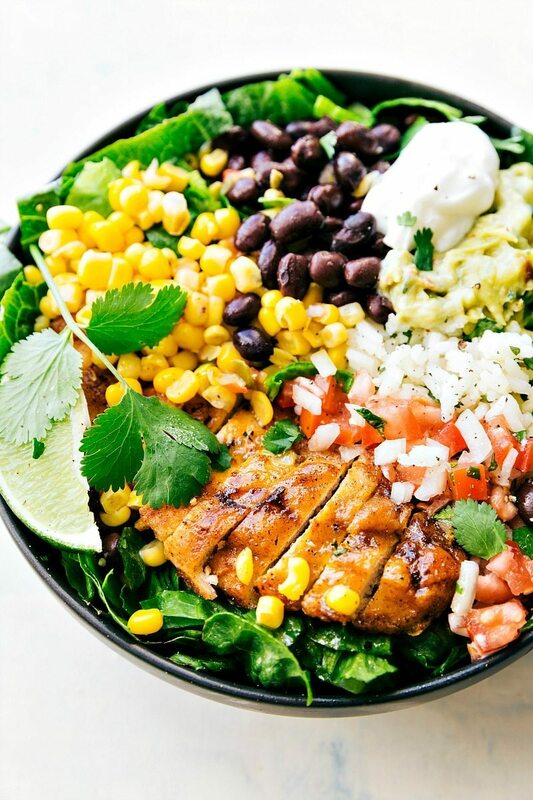 These chicken burrito bowls seriously are better than you’ll get at a restaurant! 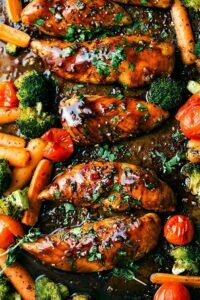 Remove fat from the chicken breasts and then either pound the chicken to even, thin pieces or slice large breasts evenly in 2 halves. Salt and pepper the chicken pieces. In a bowl, stir together the taco seasoning and white flour. Generously dredge each piece of the chicken breasts in this mixture. Warm a large, non-stick (12-inch) skillet to medium high heat. Add in the butter. Once the butter is melted, add the chicken to a single layer in the skillet. Cook for 3 minutes on one side and then flip to the other side and cook for another 4-6 minutes or until chicken is cooked through (Registers 165 degrees F with a meat thermometer.) Set aside to allow to cool. While the chicken is cooking, prep the rice: combine the rice, chicken stock or broth, and 1/2 teaspoon minced garlic in a pot over high heat. As soon as the mixture begins to boil, reduce the heat, and cover with a lid until the rice is cooked through. Once the rice is cooked through, tender, and no liquid remains, stir in 3 tablespoons (1 large) lime juice and 3 tablespoons packed & finely chopped cilantro. Season to taste with salt and pepper. 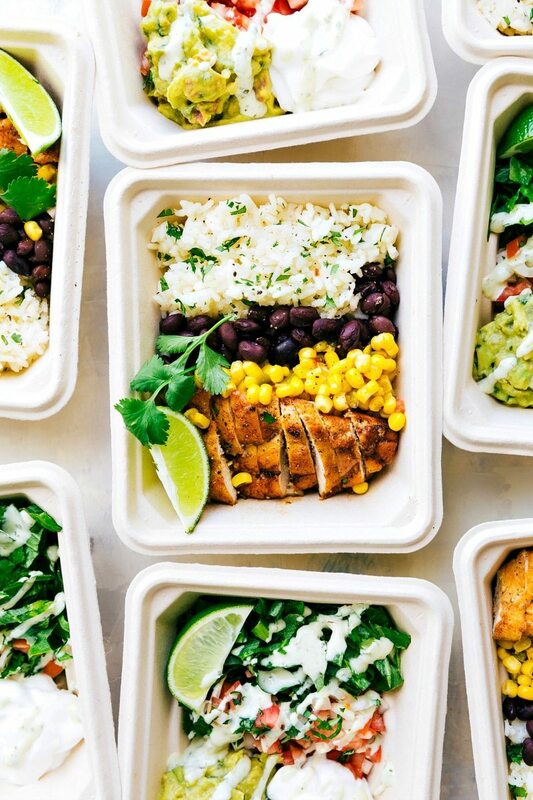 Put together: chop or slice the cooked and cooled chicken and place on one side of 4-5 meal prepping containers (or tupperware). Add a row of drained Mexicorn. Add a row of drained and rinsed black beans. Place the cilantro-lime rice next. Cover these containers and place in the fridge until ready to enjoy. Chiffonade the lettuce and then coarsely chop to get small and thin pieces of lettuce. Separate the lettuce evenly into 4-5 meal prep containers (or tupperware). Cut 2 limes into wedges and add 1-2 wedges on top of the lettuce. Place a large scoop of the pico de gallo next to the lettuce. Add one of the guacamole snack packs next to that (I don't open these up besides for the pictures in this post so they stay fresh). Add in a scoop of sour cream. For the dressing: Zest and juice the last remaining lime. Add the juice and zest to the blender along with the prepared ranch seasoning mix, remaining 1 teaspoon minced garlic, chopped tomatillo, and 1/3 of 1 bunch of cilantro (Just cut off the large stems, but the rest is fine). Add 1/2 a jalapeno (a full one for more kick, remove seeds) and the mayo. Add some seasoned salt and pepper to taste (I use 1/4 teaspoon of salt and 1/8 teaspoon pepper). Blend until completely smooth. Taste and adjust to personal preference (more lime, more garlic, salt/pepper). Whisk or blend in 1/2 cup of the sour cream. Place this dressing in a small separate tupperware or pour it into a section of each of the containers. Cover these containers and place in the fridge until ready to enjoy. When ready to enjoy, heat one of the warm containers in the microwave for 1-2 minutes and then toss everything together with one of the cool containers and enjoy immediately. Your toddler is so funny… hahahahah! At this age they don’t like to share much, but eventually he will figure out that playing with his brother is funner when he shares. 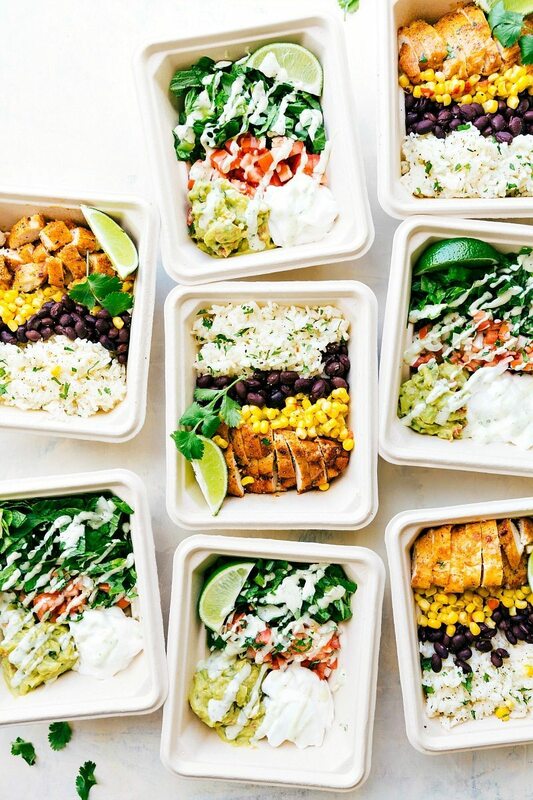 These bowls look so yummy and they make a perfect meal for lunchtime! Hey girl- this look so yummy! Perfect colours, perfect photos, perfect ingredients ! Hooked ! Have a pleasant day ! Great recipe, I think we’ll try this over the weekend. Thanks for sharing! Love those containers! Where did you find them? Thank you! I actually found them at Smiths just by the paper goods (paper plates, plastic cups, plastic wrap, tin foil, etc.) They are made by Reynolds and great disposable tupperware! 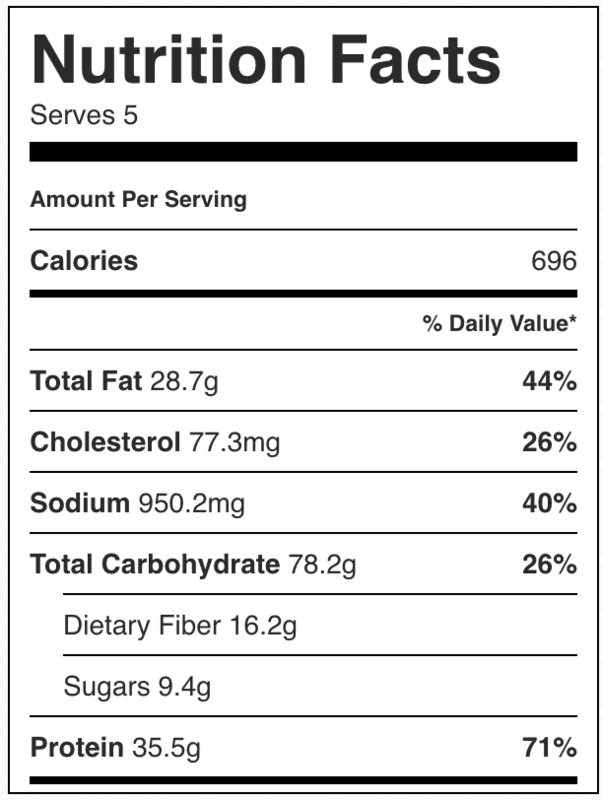 Hi, just to clarify is the 696 calories per serving, or for the 5 servings combined? 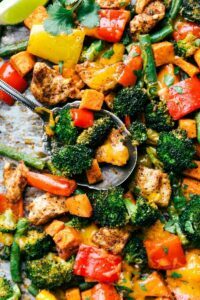 I have made this twice now and it’s a big hit with the family!